Tim Tucker's Photography Blog: Log feeder poacher? After installing the log feeder, I had a few frustrating days when the weather was too poor for shooting. I was encouraged by the fact that something had poached the peanuts out of the log feeder. I dutifully pushed in fresh peanuts at dusk every evening, hoping that the poacher was one of the woodpeckers, and not the grey squirrels who liked to raid the bird feeders every now and then! The weather forecast looked good for a change, so I got out before it got light and topped up the feeders, and positioned my tripod in the hide, on which the dew had frozen. It was going to be a bright but cold day, with little wind, but it would take a while for the sun to get high enough to illuminate the feeders, so I went back inside the house to make a flask of tea. A little while later, as I watched from the kitchen window, in came a Great Spotted Woodpecker, straight on to the log feeder! Perfect! He nibbled away for a few minutes and then disappeared. As soon as the sunlight began to hit the top of the tree, I would refill the log feeder and install myself in the hide, wrapped up against the cold. I attached the 70-200mm VR lens and 1.4x teleconvertor to my D2x, put spare batteries and memory cards in my pockets and waited impatiently. My first session in the hide (2 hours) didn't yield very much, I managed to get one picture of the woodpecker but that was about it. I think the feeder was a little close and the bird was disturbed by the shutter noise. I needed a break, my feet were cold (despite having 3 pairs of socks on inside my wellies! ), and the sun had moved round so now the log feeder wasn't in the best light. I move the feeder to take advantage of the afternoon sun and moved it back a little away from the hide, went inside to warm-up, and switched back to my 300mm lens. 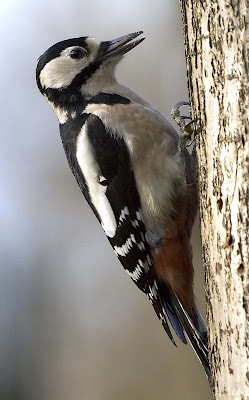 Back in the hide, I could lean forward and just about see my neighbours' birdfeeders, and I had observed that the woodpeckers seemed to go there first before coming to my garden. After an hour, sure enough a woodpecker appeared on their feeders. But, for some reason it didn't move on to my garden. My feet were starting to get cold again and after another hour I was ready to give up. Then, bang, Great Spotted Woodpecker appeared on log, I hit the shutter and snapped away in 8 frames per second bursts. Job done! As soon as the woodpecker disappeared I went back indoors to warm up and look at the results. I rotated the image slightly as the log appeared dead vertical and this looked a bit artificial, and then cropped the image slightly to get the composition you see here. Not perfect, earlier in the day would have given better lighting, but not bad all things considered.